CMV is confident that cruise ship Discovery will be cleared to sail on her next voyage, due to depart from Avonmouth on March 15. But the company remains cagey about the reasons the ship’s February 28 departure was cancelled. 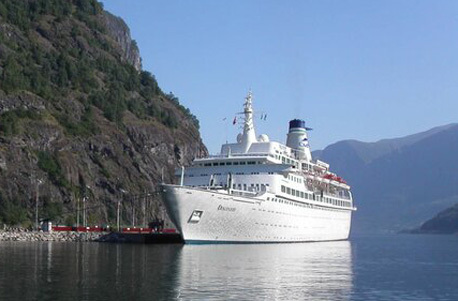 The ship, operated until late 2012 by Voyages of Discovery, had just completed a lengthy refit in an Italian shipyard prior to its return to the UK last week. An inspection by the Maritime and Coastguard Agency at Portland – to where the vessel had diverted following delays caused by bad weather in the Bay of Biscay – resulted in the ship being prevented from sailing on its planned 15-day cruise in search of the Northern Lights. An MCA statement issued today said: “Following inspections on Friday 1 March, the MCA has issued a Detention Notice on the passenger ship Discovery, preventing the vessel from sailing at this time. Pressed for further information, a spokeswoman added: “There were concerns over crew training and how familiar they were with the ship’s emergency procedures. Discovery’s technical and engineering operation is sub-contracted by CMV to Monaco-based V Ships, which provides crew for more than 140 cruise vessels, ferries and super-yachts. A CMV spokesman said: “Notwithstanding the extensive dry docking, the vessel was found, after departure to the UK, to have various technical issues which it became apparent could not be dealt with without cancelling the cruise. Passengers who boarded the ship for its aborted voyage reported finding unfinished work in the cabins and a lack of running water in some bathrooms. Pictures sent to me by one show rolls of carpet on deck, missing ceiling panels, and uncarpeted stairs. Passengers whose March 1 cruise was cancelled will be receiving a full refund of their fare, plus compensation of £250 per person and a discount of 40 per cent on a future Discovery cruise if booked by 30 April 2013. I hope someone has informed the Underwriters about this pantomime???? Same old, same old – with the best optimism possible our several cruises between 2004-2012 each suffered similar problems. Very good memories from some wonderful itineraries, but dear old Discovery’s pretense at being a ‘small alternative’ to professionally run cruise companies appears to continue to be laughable. After many cruises on Discovery the best entertainment was always to be found watching crew performances on deck at sailaway. Top rating goes to 2 hours cutting an anchor chain using third world oxywelding techniques when the anchor engine failed in Kirkwall Orkney. Almost as good was an old tow rope snapping on departure in Bridgetown Barbados allowing Discovery to swing in over the dock with a very near miss in taking down a crane and avoiding crushing the local tug that had rushed between the ship and the dock. Must admit it makes cruising on Cunard, Princess, etc seem ‘boring’ !